Last week we offered the scenario of an office worker who notarized their boss’ signature on a bid for a major contract. The worker then sent the document to a branch in another state for the notarized signature of a second executive. When the document came back, the worker noticed that their certificate had been removed and replaced with an acknowledgment certificate including the names of their boss as well as the other executive. Because the worker’s boss did not personally appear before the Notary in the other state, the worker knows that the second certificate is improper. What is the office worker’s responsibility and liability for the missing certificate? What should the worker do about the missing certificate? What should the worker do about the improper certificate? We asked our Notary community to weigh in on this conundrum and received a variety of opinions. Overall, the consensus of most commenters is that their first step would be to inform their boss about the situation and then re-notarize their boss’ signature. Tina Dancer said she would carefully record information in her journal about the incorrect certificate, including the other Notary’s name. This is a situation that underscores the challenge often faced by office Notaries: Balancing their responsibility to their employer and their duties as a Notary. In this circumstance, the office worker bears no responsibility or liability regarding the missing certificate because it was removed after the document left their possession. However, the Notary may need to prove the certificate was present when the document left their hands. Their best proof would be a complete and accurate journal entry that shows they did everything right. In the actual situation, the Notary was not in a state that required her to keep a journal; however, she kept one as a best practice. A second professional practice would be to ensure that the notarial certificate, if on a separate page than the signatures, was securely stapled to the document and a note made in the journal of this fact. But what is the office worker’s responsibility once they become aware of the improper notarization and certificate? If they say nothing, they are knowingly allowing a potentially fraudulent notarial certificate to be sent on to the receiving agency. Even though most states do not require Notaries to report misconduct by other Notaries, there could be consequences if the receiving agency ever discovered the improper notarization. For example, if the worker’s company won the contract, the contracting agency or a rival bidder could seek to overturn the decision if it could prove the fact of the improper notarization. Guiding Principle IV-E-3 states that a Notary should report illegal or improper conduct by another Notary in a potentially fraudulent transaction or notarization. Guiding Principle X-C-1 states that experienced Notaries should report to the commissioning official violations of the law by Notaries. As members of the Notary profession, Notaries should always protect the integrity of the profession by reporting such breaches when discovered. Send the document back so that the second Notary can either correct the certificate, if allowed by state law, or perform a new notarization. In this way, the office worker is making every reasonable effort to make sure the document is properly notarized, protect their employer and others relying on the integrity of the notarization. How can a notary indorce the presence of someone who was not present and not face consequence's. is this not a case of forgery? As far as I am concerned it is far to easy to receive a notary license. You may as well put the certificate in a crackerjack box as a prize. How do I request a copy of my notary public completion certificate from Dec 2014? Hello. 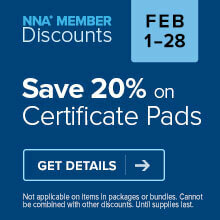 Are you referring to training or certification you obtained through the NNA? If so, please call our Customer Care team at 1-800-876-6827.